KawaiiPunk - Kawaii Mascot Blog: Chuck t-shirts at CafePress! Yep, you’ve guessed it, it’s some Chuck t-shirts! You see, it seems that CafePress have teamed up with Warner Bros. to allow fans to create their own t-shirts and merchandise for their favourite TV shows. Which sounds like a pretty good money spinner, if you ask me! And I should know! Anyway, it turns out our resident graphic designer reckoned he’d have a go at making some Chuck t-shirts and goodies. And so he did! The result… the Beer More! 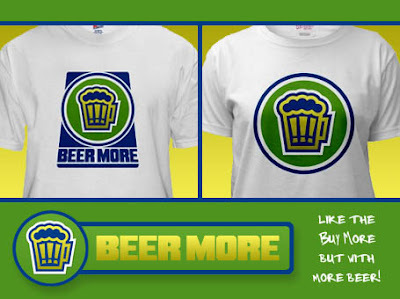 It’s like the Buy More, but with more beer! And it’s a CafePress shop, not a fictional computing chain store from an American hit comedy/action/drama TV spy show that has some of the best cameo and guest appearances in the history of television! But you probably worked that much out for yourselves already! Anyway, now it’s your turn - GO BUY SOME!